Would you like to invest small amount of money regularly? SIP is for you! Let’s understand the meaning and benefits of Systematic Investment Plan here. Have you stepped into the world of mutual fund investments? If yes, then you must be eager to get the solution for the frequently asked question, i.e., “What is SIP”. Let’s help you understand the same. Systematic Investment Plan or SIP is a smart process of investing a small sum of money in a particular scheme of mutual funds which allows you to make a periodical and regular investment either weekly, monthly, or quarterly for a specific duration to create wealth by generating higher returns. Make your first transaction through online payment via Debit Card or Net Banking & subsequent investments by periodical instalments which are payable through ECS (auto-debit) system from your bank account (once you submit the debit mandate form to your bank) on a predefined date. Thus, it is a disciplined investment procedure of building wealth in a smarter way. Start before it is too late! If you want to attain a bigger financial goal, then start investing today itself. Diversification is the key factor! Invest in different schemes to build a diversified portfolio. Invest for a longer duration to grab maximum benefits. The main advantage of investing via SIPs is that it tends to reduce the overall cost of investing when compared with the lumpsum mode. By making regular investments of a particular sum of money, you buy more units during down market and less number of units when the market goes up. This, in turn, ensures that your overall cost of investment is reduced. How Does Rupee-Cost Averaging Work? Suppose the Net Asset Value (NAV) of a particular mutual fund is Rs.10 and an investor starts SIP of Rs. 1000 per month.So, for the first SIP, he bought 100 units of the fund, i.e., 1000/10 = 100 units. On the date of the second SIP, the NAV of the fund amounts to Rs. 11 per unit and the investor buys 90 units. Again on the third SIP date, the NAV goes down to Rs.8, and the investor buys total 125 units. Accordingly, the average rate of the total units purchased by the investor stands at Rs. 9.52. If he had bought a lumpsum scheme at Rs.3000 in the first month, he would have got total 300 units at the NAV amounting to Rs.10. So, here the investor benefits with 15 extra units because of the Rupee-Cost Averaging in the SIP investment. Longer the age of your investments, larger the benefit you get at its maturity and SIP offers the same with the power of compounding. The power of compounding allows your money to grow much more each year by providing interest on interest and helps in accumulating a greater sum of money at the time of maturity. For example, if you start your investment with Rs. 2000/month @ 12% p.a. at the age of 25, you may collect up to Rs. 1.29 crore at your retirement age of 60 years. On the contrary, if you start your investment at the age of 30 years, i.e., five years late, your total investment value shall amount to Rs.70 lakh at retirement. Convenience: It allows you an easy way of investment. You can give standing instructions to your bank, and the SIP amount is auto-debited on the pre-specified date on a regular basis from your bank account. Financial Discipline With the systematic and periodical investment, the investors inculcate the financial discipline of saving and investing regularly. Lighter on Your Wallet You can start your investment in SIP with a minimum investment of Rs. 500/month and achieve greater returns. Automatic Market Timing Mechanism Most of the time it is observed that the investors time the market and waits for the correct bull or bear scenario to sell or buy the stocks in order to make profits. 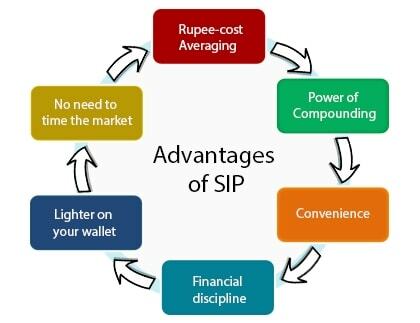 By investing through SIP, your regular investment adjusts the ups and downs automatically, and you need not time the market, as the it works as an automatic market timing mechanism. How to Start with Systematic Investment Plans? Investing in SIP plans is not a critical job, rather it allows you a very disciplined and systematic way to multiply the value of your money. Let’s take a quick tour of the rules you need to follow a systematic plan. Pen down your future financial objectives which you want to achieve, for instance, a comfortable retirement, child’s education, a big home, a jaguar, etc. Choose a mutual fund scheme and fix a certain periodical investment amount according to your financial status. Choose a date on which you will be able to pay the regular instalment as per the dates specified by the AMCs. Complete the debit mandate form and send it o your bank for validation. It will authorise your bank to pay out the periodical instalment amount on time. Finally, keep a regular check on your portfolio by analysing the returns of the same as per the market scenario and take adequate decisions. You can simply track your investment by logging in your MySIPonline account. SIP is a vehicle provided by the mutual fund which drives your money towards its growth and allows it to work for your financial goals.